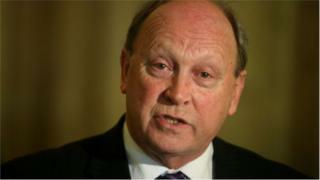 Northern Ireland will not be the "plaything" of the European Union when it comes to Brexit, Jim Allister has warned. The Traditional Unionist Voice (TUV) leader was addressing his party's annual conference in Cookstown. His party is staunchly in favour of leaving the EU and has said MPs should not back a Brexit deal unless the backstop is changed. The backstop is the insurance policy to maintain an open border in Ireland. Mr Allister said this week had seen Brexit betrayed, after MPs rejected leaving the EU without a deal. "The question now is whether Northern Ireland is next," he told his party. He said his concern with the backstop was that it could separate Northern Ireland from the rest of the UK. He was scathing of the EU and said: "We're not your plaything, we're an integral part of the United Kingdom and are determined to remain so. Hands off Mr Tusk! Stagger off Mr Juncker!" Mr Allister said the strategy of Brussels and Dublin with the backstop was to place Northern Ireland in a "waiting room for Irish unity". He also criticised the Democratic Unionist Party (DUP) for seeking changes to the deal, amid reports it was attempting to get the government to rework its legal advice on the backstop. "Nor, should anyone fall for sleights of hand in massaging legal advice to obtain an excuse to support the deal," he said, also critiquing the idea of a "Stormont lock" on the backstop. In reply, a DUP spokesperson said: "We are in discussions with the Government to ensure Northern Ireland is not separated out from the rest of the United Kingdom as we leave the European Union. "Contrary to some reports we are not discussing cash. There are still issues to be addressed in our discussions." Sinn Féin has called for a referendum to be held immediately in the event of a no-deal Brexit. "On the contrary, a proper Brexit which liberates the UK will bring added prosperity which will benefit all our citizens and therefore diminish the appeal of nationalism," said Mr Allister. The TUV has nine elected councillors and one assembly member, Mr Allister. He said the party hoped to build on its success in the upcoming council elections on 2 May. The keynote speaker at the conference was author and broadcaster Ruth Dudley Edwards.